Cloud technology has become an invaluable tool to the IT business, because of its attractive economic model. Yet, from the programmers’ perspective, the development of cloud applications remains a major challenge. 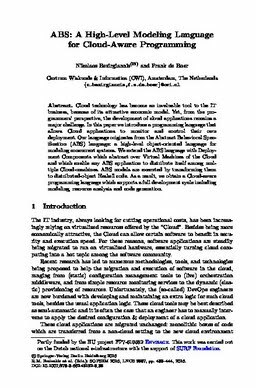 In this paper we introduce a programming language that allows Cloud applications to monitor and control their own deployment. Our language originates from the Abstract Behavioral Specification (ABS) language: a high-level object-oriented language for modeling concurrent systems.We extend the ABS language with Deployment Components which abstract over Virtual Machines of the Cloud and which enable any ABS application to distribute itself among multiple Cloud-machines. ABS models are executed by transforming them to distributed-object Haskell code. As a result, we obtain a Cloud-aware programming language which supports a full development cycle including modeling, resource analysis and code generation.